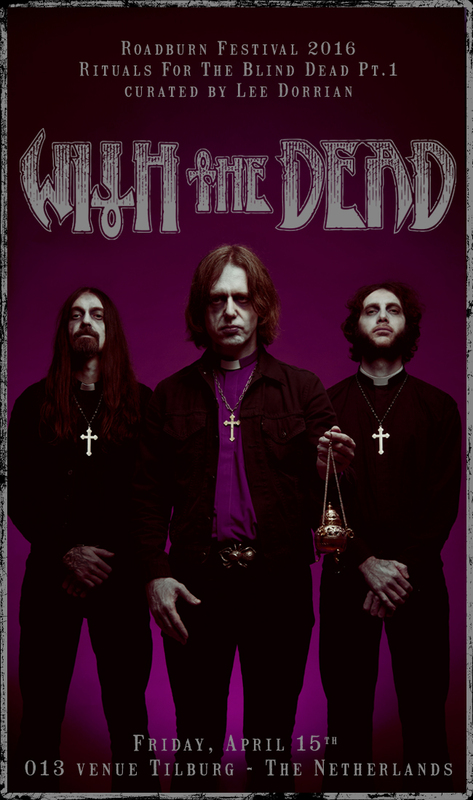 When we invited Lee Dorrian to be our 2016 curator, WITH THE DEAD was yet to be unleashed on the world. As snippets were released, and excitement mounted, we held out a bit of hope that WITH THE DEAD would make the transition from studio project to fully fledged live band. 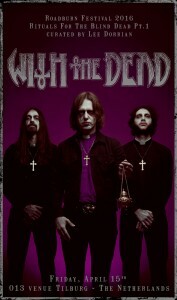 For the uninitiated, the WITH THE DEAD album was put together by an unholy trinity of doom – with individual reputations for contributing to some of the most bowel shakingly heavy output of the last twenty years. Dorrian joined forces with Tim Bagshaw (Electric Wizard, Ramesses, Serpentine Path) and Mark Greening (Electric Wizard, Ramesses) to lay down the six tracks that make up With The Dead’s self titled debut. WITH THE DEAD have swaggered into 2015 without much in the way of fanfare, but they’re already creating enormous waves. With further announcements due as to exactly how these songs will be brought to life, we’re already beyond excited to see this nihilistic doom live at Roadburn 2016. Spawned from the filthy sewers and dark basements of Amsterdam, The Netherlands, DEATH ALLEY deliver heavy punked-out proto-metal in spades. The band, revolving around former The Devil’s Blood guitarist Oeds Beydals and ex-members of Gewapend Beton and Mühr, released one the best heavy rock debuts of 2015, Black Magick Boogieland. As there’s such a bond between DEATH ALLEY and Roadburn – the band not only played the 2014 Hard Rock Hideout, based on the Over Under / Dead Man’s Bones’ 7, while Mühr did their final show, Oeds Beydals was also invited for a jam session at Mikael Åkerfeldt’s curated event, and payed a very poignant tribute to Selim Lemouchi on the main stage with the remaining enemies – DEATH ALLEY will come full circle at Roadburn 2016. Bringing Farida Lemouchi to the 2016 festival, plus inviting some other assorted friends for their performance as well, we can only expect a very special set by DEATH ALLEY, revolving around compelling tracks like Supernatural Predator. Alongside DEATH ALLEY’s Roadburn performance, Van Records will put out Oeds Beydals’ Roadburn 2014 performance on vinyl too, turning Roadburn 2016 into a benchmark moment for DEATH ALLEY! Tickets to Roadburn Festival 2016 are now on sale! Ticket sales got off to an incredible start with many of the available weekend tickets being snapped up within the first few days. There are still 3-day, 4-day, and Sunday tickets on sale. Thursday, Friday, and Saturday day tickets will be released at a a later date. It is also possible to book camping tickets via Ticketmaster.